On Monday 6th July 8pm(BST) the physiotalk team will be hosting a #physiotalk on integrating research with practice. This is a massive topic to tackle in one hour, so we’ve decided to make this a series of 2 (or possibly 3) chats – with the second tweetchat taking place on Monday 20th July 8pm focusing on guidelines in healthcare. 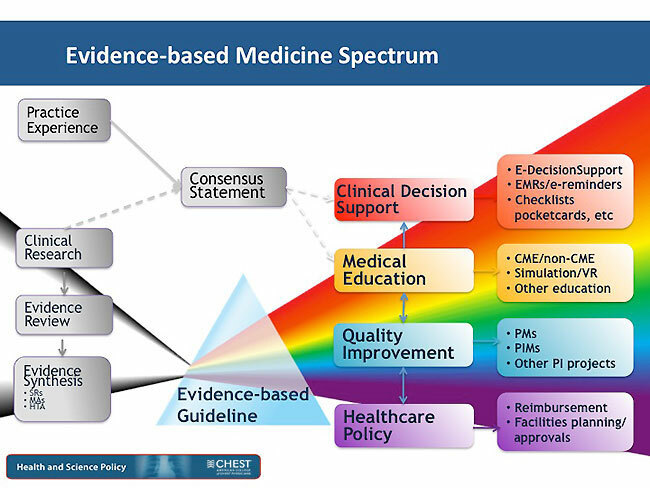 Clinical and best practice guidelines and guidance provide healthcare professionals with recommendations on the most clinically and cost effective care for patients and communities, and can offer a number of benefits including improving quality of care, improving patient outcomes, reducing variation, and reducing uncertainty over effectiveness of interventions. What are clinical guidelines, and are there other types of guidelines in health and care? Who produces them and how; and who makes decisions about recommendations? What are some of the benefits and limitations of guidelines in health and care, particularly in physiotherapy? Are they a must do or a can do – or can we just ignore them? Is compliance the right word to use when using and implementing guidelines? Who uses them and how, and how can we use them in physiotherapy? Image from American College of Chest Physicians.